My next outing on the boat is at the end of August. It may well be my last one whilst based at Norbury as we will be moving bases sometime. So the question is where to go to? The new base for the boat will be at the other side of the four counties, so it’s not as if we won’t be able to get to most places we could from Norbury, but when it comes to moving areas I suppose people do thing of going routes they won’t be able to for a while as they’ve moved bases. So with this in mind my first thought is Gloucester. A couple of years ago (when we were based at Calcutt) we went to Tewkesbury going via Stratford and several years (possibly as much as a decade ago) we went on the upper section of the River Severn (between Staffs & Worcs and Worcs & Birmingham canals), but we’ve not done much more of the Severn. Many people say that the Severn is a pretty boring route to go due to the high banks along a lot of the route, and I suppose from a video-cruise perspective I may have had this route lower on my priority list for such a reason. When we went to Tewkesbury I had originally planned a circular route returning via the Severn, but changed my mind (though this was party due to a delay because a crew member needed an emergency dentist appointment) especially as we’d got a license for the a week on the Avon so thought we may as well spend more time on it. I was speaking to another narrowboater who went down to Gloucester and did say the trip was worth it, so maybe it’s about time I went. If this is the case, then doing the Severn from Stourport to Gloucester might make a good video. Then again, nothing is set in stone and I might feel differently once we are out on the cut. 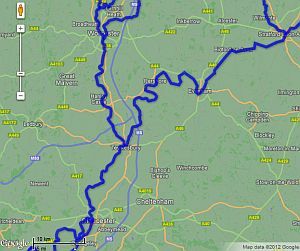 Posted on Sunday, August 5th, 2012 at 1:16 pmin narrowboat trips.